Major eruption of Oct. 24, 2014, observed by the AIA instrument of the NASA Solar Dynamics Observatory mission. Earth was added for scale. New research may have identified a mechanism that limits just how powerful explosions from the sun can become, shedding light on their ability to damage communication satellites and power grids. Solar flares are explosions of radiation from the surface of the sun that can harm satellites and astronauts in orbit. One type of solar flare, dubbed an eruptive solar flare, is associated with coronal mass ejections (CMEs), another type of solar explosion that releases torrents of super-hot plasma (clouds of electrically charged particles) into space. These floods of plasma can travel all the way to Earth's surface, triggering dangerous magnetic storms. For example, a solar flare blacked out the entire Canadian province of Quebec in 1989, nearly taking down U.S. power grids from the Eastern Seaboard to the Pacific Northwest. The other class of solar flares, known as confined, is not associated with CMEs. The result shows the presence of a reinforced multilayer magnetic cage (orange and pink) in which the magnetic rope (blue) develops during the last hours before the eruption. Prior work found that eruptive solar flares were preceded by gigantic braided arches of plasma rising from the surface of the sun known as magnetic flux ropes. These possess spiraling magnetic field lines, as if a huge bar magnet had been twisted into a corkscrew. However, it remained uncertain what triggered confined flares. One model suggested these flares were also triggered by magnetic flux ropes. Another model proposed that complex groups of loops of magnetic field lines, also known as solar arcades, gave rise to confined flares. Until now, researchers could not analyze the magnetic fields at the hot, thin regions of the sun, where confined flares originate, with enough accuracy to decide between these models. Now, based on a new analysis of a powerful confined flare in 2014, scientists suggest that aspects of both models might help explain these explosions. The joint ESA-NASA Solar Heliospheric Observatory (SOHO) captured this series of four images of a coronal mass ejection (CME) escaping the sun on the morning of April 25, 2013. The researchers analyzed the growth of a very intense confined solar flare in 2014 using NASA's Solar Dynamics Observatory satellite, which captured a series of high-precision measurements of the magnetic field of the sun's surface around the time of the flare. They ran simulations on supercomputers to reconstruct how solar magnetic fields evolved both before and during the explosion. The computer models suggested that in the hours before the flare, a magnetic flux rope grew under a powerful solar arcade that acted like a cage. This magnetic flux rope lacked the energy to break past the multiple layers of this magnetic cage. Modeling of the evolution of the magnetic rope breaking though the cage when it is weaker than the rope. Once this magnetic flux rope developed a kink and became unstable, a major flare occurred that partially destroyed the magnetic cage. The researchers predicted that a weaker magnetic cage would have led to a more powerful eruption, destroying all the layers of the cage and resulting in a coronal mass ejection. 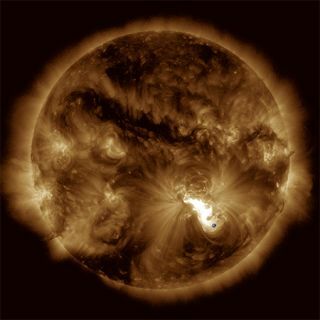 "A single mechanism may underlie all solar flares," study lead author Tahar Amari, an astrophysicist at the Polytechnic School in Palaiseau, France, told Space.com. This work could help scientists forecast the maximum amount of energy that a solar flare can release, Amari added. Amari and his colleagues detailed their findings in the Feb. 8 issue of the journal Nature.